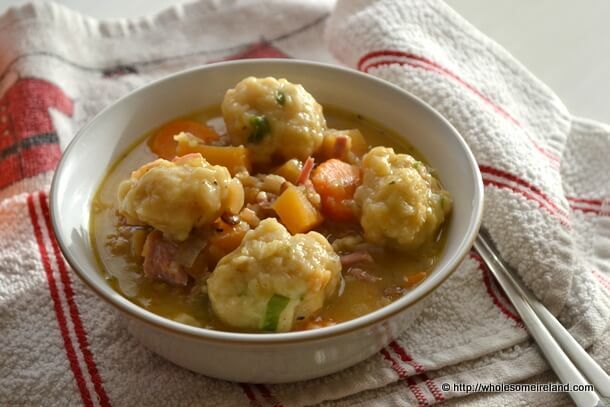 This ham soup with dumplings is a great one-pot meal. You could even freeze the cooking water from the ham on Christmas Day and reheat it to make the soup at a later date. Take a large, heavy bottomed saucepan with a firm lid. Pour in the stock, soup mix and chopped vegetables and bring to a simmer. Put the lid on and simmer for 20 minutes. In a mixing bowl, combine the flour, baking powder, scallions and melted butter. Then slowly pour in the cold water in quarters. Stir the mixture with a fork and stop adding water when you have a stiff dough. Once the vegetables in the pot are cooked and tender, stir in the shredded ham. Shape the dough into small ping-pong sized balls. Sit them on top of the soup. Put the lid back on the pot and simmer for 15 minutes. Using a large spoon, gently turn the dough over and simmer for a further 10 minutes. Serve in large soup bowls and eat with a spoon. NB: Soup mix is a dried mixture of pulses that you can buy in your supermarket. There are 2 types. One requires presoaking, I only buy the ready to use version! You’ll typically find a mixture of barley, wheat, lentils and small beans in the mixture. 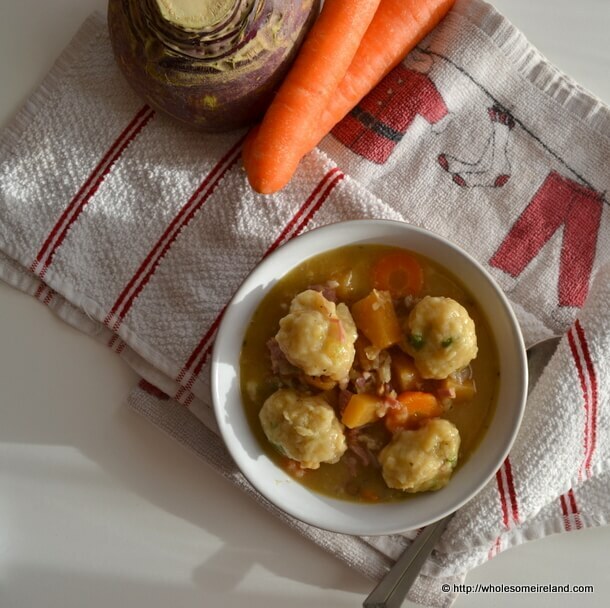 Very handy for bulking up a soup or stew and adding fibre to your diet. Himself isn’t a great parsley fan so I left them out. I agree though parsley is essential ingredient in proper dumplings!